The Pavilion is located just a few miles from I-45 and offers free parking. Lots open 30 minutes before gates. Please use the addresses given below for the type of parking you prefer. Take Interstate 45 or the Hardy Toll Road north. Exit Woodlands Parkway. Go straight thru the Six Pines Drive light and follow the signs to the next available free parking lot. Take Interstate 45 south. Exit Research Forest Drive. Turn right on Research Forest Drive. Take a left onto Grogan’s Mill Road. Continue on Grogan’s Mill Road. Proceed to Timberloch Place and follow the signs to the next available free lot. 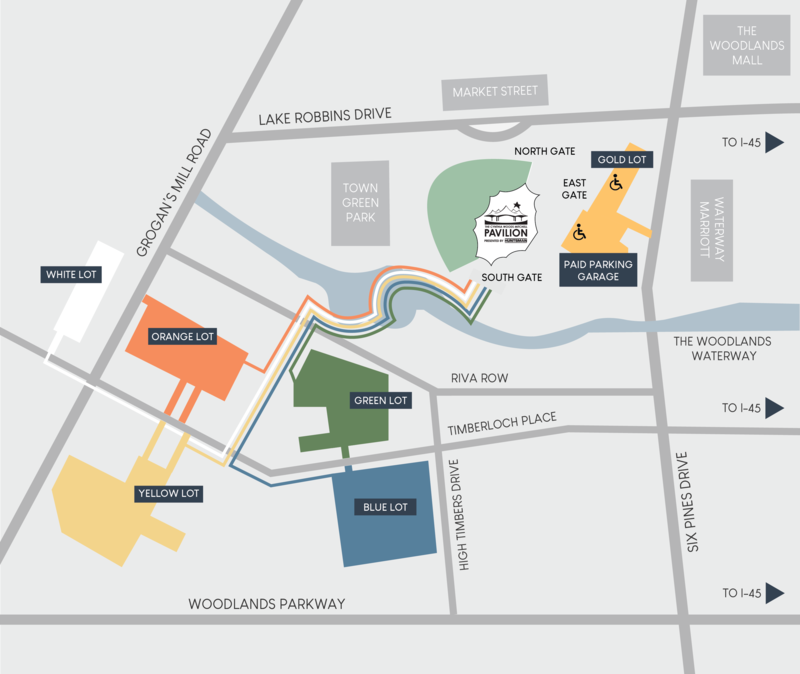 From Timberloch Place you can access the Yellow, Orange, Green, Blue and White free lots. Take Interstate 45 or the Hardy Toll Road north. Exit Woodlands Parkway. Turn right on Six Pines Dr. Follow the signs to the Pre-Paid Parking/Gold Lot. Take Interstate 45 or the Hardy Toll Road north. Exit Research Forest Drive. Turn right on Research Forest Drive. Take a left onto Grogan’s Mill Road. Continue on Grogan's Mill Road and follow the signs to the Pre-Paid Parking/Gold Lot. *Please note that paid parking is limited in space. Paid parking can be purchased prior to the event. Take Interstate 45 or the Hardy Toll Road north. Exit Woodlands Parkway. Go straight thru the Six Pines Drive light, and take the Grogans Mill Road exit. Turn right onto Grogans Mill Road. Turn right onto Lake Robbins Drive.